Premium Compatible Label Tapes for the Brother P-Touch 2430 printer. Q. Are these Brother P-Touch 2430 label tapes feasible for home use? Can I use them for the outdoor purpose also? A. Yes, these label tapes are used widely by people at home. They are feasible to be used at home, offices as well as outdoors. Due to the premium quality of the tapes, they are able to withstand abrasions and scratches and can work at high temperature also. We guarantee you that these Brother P-Touch 2430 label tapes will work fine in any condition. Q. What are the sizes of Brother P-Touch 2430 label tapes available with you? A. We supply the label tapes in 3 sizes that are 9mm, 12mm and 18mm. Q. How to connect P-touch labeler to the power supply? A. There are two methods to connect PT-2340 to a power supply. One by connecting it to the adaptor and other by inserting batteries. When you are using the AC adapter (AD-24ES), insert the plug on the adapter cord into the adapter jack on the bottom end of the P-touch labeler. You must insert the plug into the nearest standard electrical outlet. If you are using the P-touch labeler with batteries, insert all the six new AA alkaline batteries (LR6), making sure that their poles are pointing in the correct direction. Make sure to replace all the six batteries at the same time by the brand new ones. Q. Are Brother P-Touch 2430 label tapes available in both, genuine and compatible versions on this site? A. We at Printer Ink Cartridges supply the premium quality range of compatible label tapes for your Brother P-Touch 2430 printer that works great as the originals ones. Q. After exiting P-touch Editor Lite, how can I restart the program while my machine is still on? A. There are three ways to restart the machine you can perform any of the followings. Q. Do I need to install any software in order to make creative labels from Brother P-Touch 2430 Label Tape Labeler? A. 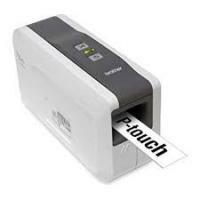 The P-touch labeler uses P-touch Editor Lite software, which is already installed on your labeler. There is no need to install any software or drivers onto your PC in order to make creative labels. Q. Can I use other types of tape for printing labels from my Brother P-Touch 2430? A. No, you must use only the Brother TZ tapes with this machine. Do not use any low-quality tapes that do not have the TZ mark on it. Q. I have so much space left in the left and right side while printing labels. How can I adjust the left and right margins of the label to print maximum letters? Q. Do you provide free delivery on purchase of Brother P-Touch 2430 label tapes from this site? A. Unfortunately, we do not provide free delivery as all our orders are delivered through the Fastway Couriers within 1-2 business days. Our delivery charge is £1.99 inclusive of the VAT that will increase according to the weight.